If you are not so good at managing yourself, you may not be the best at managing other people. You may be a great people manager, motivator, and team builder, but have no financial reporting or systems for your business, and no clue whether your net profit is going to be $80,000 or $110,000 this year. You may love to create systems and operations for your business but not be a warm and fuzzy people manager. The weakest link for real estate agents, surprisingly, is financial. Real estate agents handle the largest financial transaction of many people, are motivated salespeople who want to make money, and have to work with numbers in their business. Yet, the vast majority of real estate agents have no, or very little, financial management of their business. Even worse, real estate agents have a very high bankruptcy rate, often due to a lack of management of paying their taxes. Since a real estate agent progresses from seeking survival and self employment, to stability, to financial success, it is important to manage the finances for your overall life and your business. Your business finances must be 100% separate from your personal finances. You need a separate legal entity, such a Schedule C business or LLC or Corporation. You need separate credit cards and separate checking accounts. Run your business like a business and you are far more likely to succeed and actually have a business in 10 years. As always, we are here to help. Just email steve.kantor@billiondollaragent.com with your situation, basic numbers, and current budget, if any, and we will provide a budget template and also tell you how you compare with other agents at your level of GCI. McDonalds has a system. 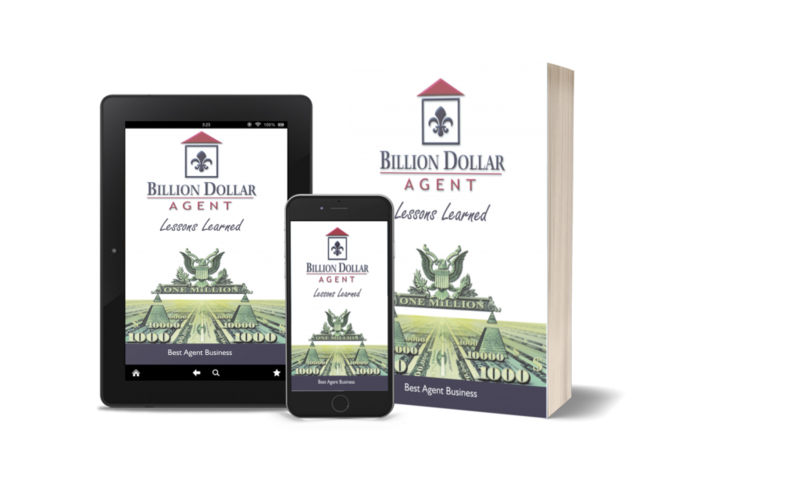 A Billion Dollar Agent has a system. As you read the interviews, you can probably guess which agents have more detailed systems than others. The personality of a typical real estate agent, and a hunter salesperson, is not the type that likes to sit down for hours and write documentation of systems. You can start small. You probably have developed a checklist of steps for transaction coordination. It may be in your head or a cover sheet on your files. Leverage includes systems. Just as one hour of planning is worth ten hours of doing, one hour of creating systems is probably worth ten hours of doing. If you create a system, you can repeat a service level consistently. You will have far fewer ‘people’ problems. Many people problems in a small business, as perceived by the owner, are really systems problems of lack of a system and lack of communication. Another word for systems is operations. Operations are how things happen in your business. If the process is documented well, then you can call it a system. Email steve.kantor@billiondollaragent.com and describe your problem/challenge related to systems and where you would like some help. Also, if you have a great system you want to share with others, email that as well. People management is one of the hardest things for a small businessperson. There are almost 1,000,000 businesses with 1-10 employees in the United States. Most real estate agents have never recruited, hired, fired, trained, and managed a staff before, especially for a business that they own. It is not easy, and often it’s not the perfect fit with the personality of a driver entrepreneur. From the very start, get help. You may also want to consider outsourcing as much as possible to vendors to delegate the recruit, hire, fire, manage, train, and document tasks to them. This allows you to focus your energy even further. You are able to delegate tasks, without having to spend the additional emotional and management energy, to find, train, and manage those people. Email steve.kantor@billiondollaragent.com and I will point you to free resources to analyze your personality as it relates to working with employees and some resources to help interview and screen employees.